NO SIGNAL DIFFERENCES, BLANK IMAGE. In our effort to right the shameful wrong that has been done to Raymond Damadian, M. D., by this year’s Nobel Prize Committee for Physiology or Medicine, we now share with you, in historic photographs, the “exciting discovery” that “opened the door for a complete new way of imaging the human body”1 and the subsequent technical improvements that have led to today’s MRI. These photographs and other materials are an inarguable testimony to the truth of discovery. The only violation of the truth – and to Alfred Nobel’s requirement to reward only “discovery” in medicine3 – resides in Stockholm, where unacceptable manipulations allowed this shameful wrong to be perpetrated and where those responsible are prepared to celebrate both wrongs on the evening of December 10th. Picture A. The Two Signals together. The two signals together create bright cancer pixels surrounded by darker normal pixels. The marked signal difference discovered by Dr. Damadian supplied the needed contrast that had been lacking from X-rays of the vital soft tissues for almost a century. These are genuine radio signals put out from the atoms inside the tissues when the body is in a strong magnetic field. They are picked up by the receiving coils of the MRI shown in the illustration. Picture B. The bright pixels detecting the tumor are only in the image because of the cancer signal discovered by Dr. Damadian. The signal we’ve illustrated above is the 1970 discovery that “opened the door for a complete new way of imaging the human body…. NMR [the former name of MRI] developed into a laboratory spectroscopic technique capable of examining the molecular structure of compounds, until Damadian’s ground-breaking discovery in 1971.”1 The exciting discovery that the signal from cancer tissue is much stronger2 (long T1 and T2 relaxations) than the signal from normal tissue prompted Dr. Damadian to propose the first MR body scanner. To make it a reality, he invented the first method ever for achieving an MR scan of the body. His method provided the necessary 3-dimensional technique. This method was reported in the Downstate Reporter, Spring 1971, and was recorded in his 1972 patent. Paul Lauterbur, one of this year’s Nobel Prize winners in medicine, did not attempt to improve Damadian’s method until the fall of 1971. He proposed the application of the magnetic gradient of Gabillard, Carr, and Purcell, but his initial effort simply replicated the 1-dimensional technique they had demonstrated in the 1950’s. The first ever scan of a live human being was achieved by Damadian, using the method of his patent (see historic image below). 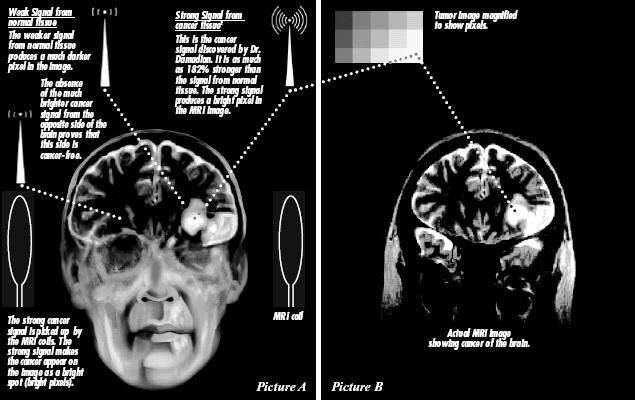 The MRI image is only there because of the signal differences in tissues that Dr. Damadian discovered. The marked difference of the two signals supplied the contrast needed to see cancer. This difference had been lacking in X-ray pictures for almost a century and badly hampered the ability of medicine to detect serious disease within the body. When Dr. Damadian was measuring the strength of the cancer signal, he had to measure the strength of the NMR signals from a variety of normal tissues. This was necessary so he could compare the signals from normal tissue of the same type as the cancer tissue. During the process, he measured the NMR signal differences from a full range of normal tissues, including muscle, liver, stomach, small intestine, kidney and brain. Although a number of random measurements had previously been made on isolated normal tissues, he was the first to measure a full spectrum of normal tissues under identical conditions – using the same magnetic field strength, same animals, and same NMR method – thereby making a direct comparison of their signal strengths possible. He tabulated them in his Science paper. He discovered that the signal strength differences among the healthy tissues were also enormous – a range of 132%, compared with X-ray’s maximum variation of 4%. For example, a difference of 257 milliseconds for the small intestine and 595 milliseconds for the brain. No wonder Dr. Freeman Cope, an NMR collaborator of Dr. Damadian's on other NMR studies, told Dr. Damadian, "Your cancer paper contains a second discovery. No one has ever reported a comparison study of the healthy tissues. There are major differences here as well." The dramatic differences in signal strength among healthy tissues create the dramatic differences in pixel brightness that enable modern MRI machines to provide exquisite detail of the internal anatomy, such as the detailed structure of the brain. The two winners the Nobel Committee for Physiology or Medicine have chosen to honor for the MRI did nothing more, or less, than contribute improved ways to image the tissue signals that Dr. Damadian discovered. It was, however, only after the two winners – the chemist and NMR specialist Paul Lauterbur, Ph. D., witnessed a repeat of Damadian’s landmark experiments and Damadian’s experiments were brought to the attention of Peter Mansfield, Ph. D.– that they began to think about the possible applications of magnetic resonance to medicine. For nearly 100 years, the detection of disease within the soft tissue of the human body was limited by the X-rays inability to see soft tissue clearly. It could distinguish it with a maximum contrast of only 4%. On the other hand, Damadian’s breakthrough discovery was the extraordinary difference in the contrast between MR signals from cancer tissue and normal tissue. It was as high as 182% -- or over forty times greater than the X-ray. Here was indeed an unprecedented new tool for the early detection of disease. In Damadian’s ground-breaking 1971 paper he used the word “detection” many times but he never once used the word diagnosis. Some non-medical people misunderstood why. There is a medical reason. The detection of disease is different than the diagnosis. Detection comes first, diagnosis second. All medical imaging machines are only meant to detect. Diagnosis can only be done with a needle biopsy of the lesion in the image and an examination of it under the microscope – a second step required no matter what kind of imaging machine is used to detect the disease. With the observations by others who were following up Damadian’s discovery, it was found that most disease tissues also have strong signals. Therefore, Damadian’s initial cancer-signal discovery actually opened the door to the early detection of far more diseases than he originally imagined. The cancer signal discovered by Dr. Damadian is the engine that powered the MRI from the outset and continues to power every MRI machine in use today. Of the contributions made by the two scientists named for this year’s prize in medicine and Raymond Damadian, only Damadian’s discovery is still in use on every MRI scanner, every day, throughout the world. The improvements of Damadian’s original 3-D scanning technique by both Lauterbur and Mansfield have been replaced worldwide by the spin-warp imaging technique invented in 1980 by the University of Aberdeen group of Hutchison, Edelstein, and Mallard. A subsequent train of other inventors have made many more improvements since then. Millions of cancers are detected around the world each year because of the Damadian cancer signal. The early detection that this highly sensitive signal allows is saving millions of lives every year, as well as preventing untold agony. It is also sparing millions of patients from unnecessary surgeries, and it is providing more frequent assessments of therapy, so the therapies can be modified to achieve success. The true history of MRI is copiously documented, and all the documentation was meticulously and repeatedly provided to the Nobel Committee for Physiology or Medicine over the years that the award for the MRI has been under consideration. The scandalous truth is, the NMR clubhouse of Nobel insiders are attempting to rewrite the history of the MRI and write Raymond Damadian, M. D., out of it for the false distinction of their cronies. Without an immediate reconsideration that would include Dr. Damadian in this year’s award for medicine, Nobel insiders will have heaped irremediable shame on the prize and, in fact, will render this year’s Nobel Prize in Medicine scornfully irrelevant to history, as well as a violation of the will of Alfred Nobel. Alfred Nobel was very meticulous in specifying what each award was to be given for. In medicine he specifies that the prize for the person who “shall have conferred the greatest benefit to mankind” must be limited to “discovery.”3 He does not allow inventions or improvements, as he does in chemistry and physics. Yet inventions or improvements are the only things this year’s Nobel Committee has chosen to honor, while it excluded the only scientist who made the discovery that originated MRI. The shameful wrong of Raymond Damadian’s exclusion has yet to be honestly addressed and courageously righted. Who would call that the high-minded voice of moral humanity defending a valid decision? What we have instead is a persistent refusal to acknowledge the truth and honor it. Alfred Nobel mentions nothing about statutes in his will. More importantly, the “statutes” of Nobel’s will itself appear to be of no consequence to the Nobel Committee, since, we note, they alter them whenever they like. So who can take seriously Committee statutes that do not even appear in Nobel’s will? There is only one pedestal on which the Nobel Prize can rest if it is to remain the world’s preeminent award for scientific achievement: the pedestal of truth, truth inviolable. It was Damadian’s idea to make the MR body scanner4. And he provided the signal to do it5. And he provided the first-ever scan method to accomplish it6. And the first human image ever by using it. Willfully exclude him? Can you imagine! In our effort to right the shameful wrong that has been done to Raymond Damadian, M. D., and, along with it, to the will of Alfred Nobel, we appeal to concerned citizens everywhere to let your voices be heard in protest to this shameful treatment of the man who has been widely regarded as the inventor of the MRI for nearly 30 years and the shameful wrong to the very inventor who established the Nobel Prize. We ask you now to join the worldwide outcry and insist that this year’s Nobel Prize in medicine be based on the truth of scientific discovery and on the will of Alfred Nobel. Let your voice be heard, now. 2. A strong signal and a signal with an elevated relaxation time or prolonged decay rate are identical statements. In the T2 image shown, the relation of signal strength to decay time is given by S = e exp -TE/T2, where S is the signal strength. Note that as the signal decay time increases (T2 increase), the signal strength simultaneously grows (TE held constant). For more documentation, visit www.fonar.com. Damadian outlines his voxel-by-voxel scanning method, recorded in his 1972 patent. It works. to scan 1 dimension as Gabillard did. It’s incomplete: 3 dimensions are needed. High Court on U. S. Patents and the U. S. Supreme Court enforce Damadian’s patent, finding an “insubstantial difference” between how modern MRI’s produce an image and his T1 and T2 discoveries. PHOTO 2: Dr. Damadian with his postdoctoral research fellows, L. Minkoff and M. Goldsmith, and the first MR scanner, which the team built by hand at New York’s Downstate Medical Center. PHOTO 3: The world’s first MR scan (image) of the human body, completed on a cross-section of Minkoff’s chest by Raymond Damadian, M. D. and his team, utilizing the method of his patent. In addition to making the original discoveries on which all MRI’s are based (T1 and T2 tissue relaxations) and building the world’s first MRI by hand. Dr. Damadian also invented the first Open MRI, the first mobile MRI, and now the first Stand-Up™ MRI. Dear Member of the Nobel Committee: The truth must have a place. I/We believe this year’s Nobel Committee for Physiology or Medicine should include Dr. Raymond Damadian. Paid for by Friends of Raymond Damadian. Contact DanielCulver@aol.com or call him at 631-694-2929.